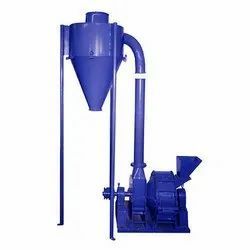 Manufacturer of a wide range of products which include impact pulverizer machine. Made from heady duty Mild Steel fabricated body. Grinding Chamber lined with serrated wear plates, which protects the body from wear and tear. Grinding done by a set of swinging blades or hammers on a balanced rotor. A screen classifier forms the lower half of the grinding chamber.For Super Model blower driven on a separate shaft with the help of a ‘V’ belt adjustable drive from the rotor shaft.For Standard/ Economical, the rotor & blower driven by single shaft there is single speed of rotor and blower.